We love eating fruit chips from the grocery, but they're really expensive and you get such a small amount in each bag that I was determined to find a better way to enjoy this awesome snack. I've been buying gorgeous pears and apples at the farmer's market lately, and I decided to try my hand at homemade fruit chips. While I cut away, Kenya had a blast laying them out on the baking sheets before we popped them in the oven. I had to make sure I sliced fast because for every piece Kenya laid out, at least two made their way into his mouth! If I were you, I would pull out all your cookie sheets and layer them up with lots of fruit because when your family tastes these Pear and Apple Chips, they're going to go fast. 2. 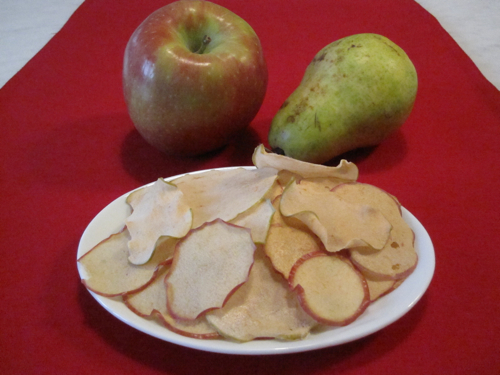 Using a mandoline, thinly slice the apple and pears into “chips” ( I love my hand mandoline, but you can also cut them with a knife into thin slices if you don’t have one). 3. Place the slices on a Silpat or parchment lined baking sheet making sure not to over lap the pieces. 4. Bake for 1 hour, turning the “chips” halfway through (if you live in a humid climate, they may take a bit longer). *You can place several cookie sheets in the oven at the same time if you want to make a large amount. These sound great! I spent a large portion of yesterday making huge quantities of baked sweet potato and butternut squash chips for this week's lunch boxes, so I'm in the chip mood. Have you tried adding cinnamon and nutmeg to them? I wonder if it would be better to do that before baking, or to sprinkle and toss while they're warm from the oven? Adding cinnamon and nutmeg is great idea! Just sprinkle some on top before you put it in the oven. Hi! Love this! Do you store yours (if there are any left) in a ziplock bag? Thank you. I made these yesterday after watching the video and my 1 and 3 year old loved them. I think I still managed to eat more than they did! They were delicious! what to do if there is no parchment paper handy? You can use a silpat or you can try foil. This may sound silly, but how to you slice the friut with regards to the core? Do you just cut right through it and bake it all or somehow remove the core? My 20 month old helped make apple chips as well. I sprinkled them with Splenda and cinnamon before baking and they have turned out delicious! I didn't have luck with the bananas, I couldn't slice them lengthwise without them breaking up. I tried doing them in slices but they didn't turn out well. Any suggestions? I don't have a mandolin, but I may get one soon. Thats a bummer! Have you had a chance to watch the video on the banana leather? Were the bananas really soft? And how long did you leave them in the oven? Most oven are different, you may have had to leave them longer. I just tried making these, but mine crumbled apart...they were only in the oven for about 40 minutes. I think that I sliced them too thin. About how thin do you cut your slices using your mandolin? Fantastic...almost sliced my finger off as it was the first time I used a mandoline, but once I got the hang of it...very fun and delicous for the whole family! Yum! I tried this tonight with one apple after my daughter went to sleep. Let's just say, there aren't any left for her to taste tomorrow! Thanks for the great idea! Question, i just tried to make apple chips and they just kind of shriveled up and were still pretty soft (had the same problem with carrot chips), should i be lowering my oven temperature? What temp have you been using? You might actually need to raise the temperature. Also, get an oven thermometer to make sure your oven is at the temp you're setting it to. For chips you need to cut them very thin. I highly suggest using a mandoline! What do you think the shelf life of these are in a Ziploc? I wouldn't put them in a ziploc bag because having them airtight can make them lose their crisp! I store them on the counter, loosely covered, for up to 5 days! I tried to bake these, most burnt &amp; some were not fully cooked @ 225 in under 2 hrs. I am a bit disappointed these didn't work out for me. I even purchased a mandoline &amp; parchment paper. I'm not giving up yet but I am unsure why some burnt while others weren't close to being done and they were all about the same size. Jenny, it sounds like maybe your oven is uneven? Sometimes ovens and microwaves are hotter in some spots, and not hot enough in other spots. I have tried a few batches of these now. Delicious! I have tried both on parchment and without. In my climate, northen alberta, non parchment works best and mid oven rack. I used my pizza stone to cook a batch which were the best ones so far but I am going to still try cooking on the cooling rack. Great suggestion. Cooking on the parchment for me just let them brown or stay soggy. Love them though. Keep up the great work! These are delicious!! However, I haven't had any luck making them into 'chips.' I have baked them a few different ways. I first tried on parchment paper. I found, as many others did, that they were just soft and stuck to the paper. I tried cooking them on a cooling rack as suggested and they didn't even get close to being crispy. In fact this was my least favorite method. I tried them on a pizza stone which is by the best results! They still did not get crispy, but they were closer and the taste is definitely there! My 16 month old LOVES them (as do myself and my husband!). Maybe it's time to up the temp? I don't think cooking them longer would help because they are already in there an hour plus! I would like to know suggestions on how to store them since they are not exactly chips- more like the \"dried\" apple pieces you can get at the store. Great recipe all in all though- healthy delicious snack!! Easy to make. Thank you for the great recipe! I'm just wondering what is the serving size for the mentioned nutrition facts? The temperature is in Celsius or Fahrenheit ?